I went to a baseball game earlier in the week and was reminded of how little I care about baseball and how deeply I care about those wonderful concession workers who take it upon themselves to combine obscene amounts of calories and then dunk them in oil. I felt the need to show some appreciation to these people who were just waiting for someone like myself to turn away from the field of players and take one of those crispy funnel cakes or soft pillows of cotton candy off of their hands. I very seldom eat any kind of fast food, and I am a tiny bit fussy about reading ingredients lists, but when a row of food carts lies before me, I temporarily abandon my food fears and wholeheartedly indulge. Sadly, my food cart fantasy land was lacking one very important portable food - there were no frozen bananas. Not a one. I have always loved frozen, chocolate covered bananas with their melty, chocolate coats and their ice cream-like interiors. As I was trying to contrive an inventive idea for this week's s'more, those familiar frozen treats would not leave my mind. I sliced two bananas into 1/2-inch slices and piped a pillow of marshmallow fluff unto the surfaces of half of them. Then, I topped them with the remaining slices that had been skewered with a popsicle stick before hand. It's best to get the stick through the banana slice before you layer the slices, otherwise, you will end up squeezing out all of the marshmallow. The banana sandwiches need about an hour in the freezer before you can dip them into the sea of melted chocolate. To thin out the chocolate a bit, I like to add a spoonful of coconut oil. Coconut oil is solid at room temperature which is perfect when we want a shiny, firm coating that will not melt the moment we take it out of the freezer. After the bonbons are dipped, graham cracker crumbs are sprinkled and these tiny pops are returned to the freezer for 5-10 minutes to help the chocolate set. In my mind, this is the perfect weekend treat. Every day ingredients, minimal preparation, and true sweet tooth satisfaction. 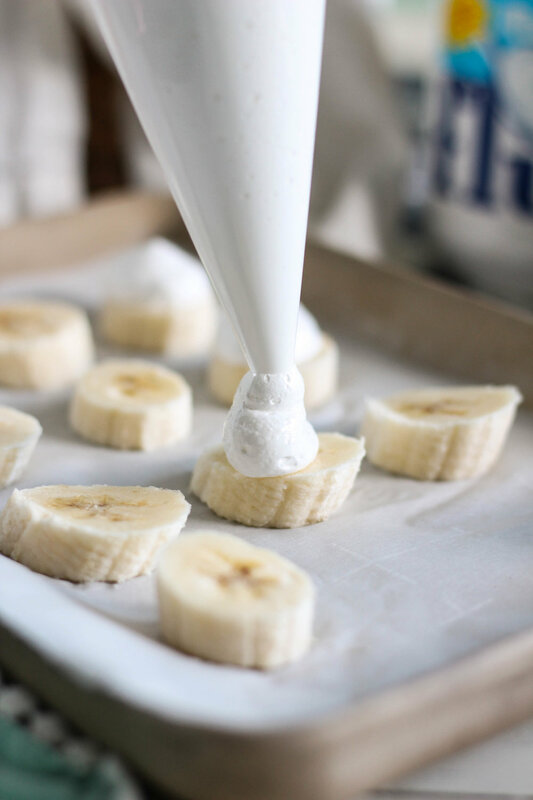 Slice bananas into 1/2-inch slices and lay half of them onto a baking sheet lined with parchment paper. Fill a pastry bag with marshmallow fluff and cut the end so that it is about 1/4-inch wide. Pipe a small amount onto the surface of each banana. You might be tempted to ignore the whole pastry bag thing and just spread your marshmallow on with a butter knife. Resist!! Bananas are slippery and marshmallow is sticky - the two do not make a good match. Believe me, a pastry bag is the way to go. Insert the popsicle sticks into the remaining half of the banana slices, pushing the stick all the way through so that about 1/2 inch of the stick shows. Insert this part of each stick into the marshmallow-toppled slices, forming little sandwiches. Combine chocolate chips and coconut oil in a small, microwave-safe bowl. Microwave for thirty seconds, then remove and stir. Return the bowl to the microwave and continue heating in thirty second increments, stirring after each, until the chocolate has melted. Dip the frozen bananas into the melted chocolate and return to the parchment-lined pan. Sprinkle with graham cracker crumbs and freeze for an additional 5-10 minutes, until the chocolate has set. Serve immediately or place in zip-top bags and freeze for up to one week. Enjoy! !